Charts, replays, and occasional updates to be added through the day. 4:25 PM: Stephanie’s Kitten, the 2011 Breeders’ Cup Juvenile Turf Fillies winner, just earned her way into this year’s Filly and Mare Turf with a win in the Flower Bowl at Belmont Park as the 6-5 favorite (following second-place finishes in the Beverly D. and Diana this summer). You know Stephanie’s Kitten will be at Santa Anita so long as she’s sound, but the same can’t be said for Kelso Handicap winner Vyjack — according to the post-race quote sent out by NYRA, trainer Rudy Rodriguez had been targeting the Cigar Mile. “I have to talk to the owner and see what his plans are now,” said Rodriquez. Woodward winner Itsmyluckyday, not Breeders’ Cup nominated, finished third in the Kelso. Said Jockey Paco Lopez after, “He tried really hard, but I don’t think he liked the track.” Woodward runner-up Moreno is pegged as the 7-2 second favorite on the Jockey Club Gold Cup morning line. 4:55 PM: Private Zone must like Belmont. Winless in three starts since last year’s Vosburgh Stakes, he became the first horse in 24 years to win the Vosburgh for two consecutive years (the last was New Jersey-bred Sewickley in 1989-1990, whose broodmare sire was Dr. Fager, a back-to-back Vosburgh winner in 1967-68). 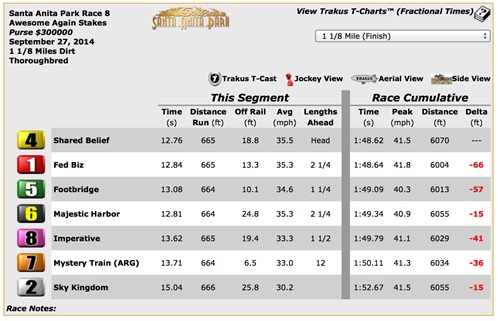 Too bad for Private Zone that the Breeders’ Cup is at Santa Anita again. He finished 10th in the 2013 Sprint.